Want to see where an iPhone has been? 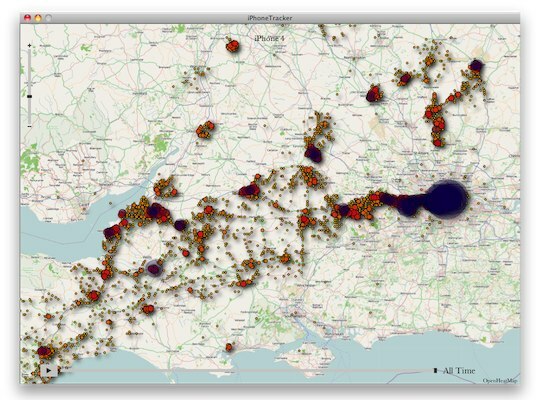 How about a detailed map of an iPhones movements, tracking hotspots of where it is physically located most often? Check out iPhoneTracker, a free app that does exactly that. iPhoneTracker works by parsing through locally stored iPhone backup files and placing stored location data on a map. The image up top shows one of the detailed maps of iPhone movement the app produces, and you can see a movie generated based on tracking iPhone locations at the bottom of this post. So it’s not entirely accurate, but it’s close. Now, there’s been a bit of hub-bub on the web about iPhone’s tracking your location and movements but I’m not sure why anyone is surprised by this. Remember, your iPhone (and iPad 3G) pings cell towers constantly and has a GPS unit in it, of course it’s going to track your physical movements. The real question is why exactly is this data being stored locally? Who knows, but I’d guess that any device with cellular triangulation or GPS keeps similar information. Some people are finding this location tracking creepy, but personally I think it’s interesting to look at. It’s worth mentioning that iPhoneTracker only works to check locally stored iPhone and iPad backup files, meaning you can’t use this app to remotely follow someone else. Yes, you could run this app on any Mac and it will map out that iPhone/iPad users location data, but that’s pretty invasive and you probably won’t make any friends doing so, and remember that the location data is not 100% accurate. If you don’t want someone to be able to use this app to track your iPhone movements, all you need to do is encrypt your iPhone backups. This causes the backup file and your location data to become unreadable unless the backup is decrypted, which would require your password in iTunes. Encrypting your backups is a good idea in general, regardless of how you feel about location tracking. Currently the iPhoneTracker app is for Mac OS X only, but the code is open sourced so a Windows and Linux version will probably be released in the near future. This isn’t the first example of the iPhone tracking location data, by default iPhone photos store GPS metadata, which can then be retrieved through Preview.app on any images taken by an iPhone. That feature can be easily disabled, however. Whoa! This app nailed my location and movements with incredible accuracy, it basically shows my life for the past 2 years and I think it pieced together data from both my old iPhone and new iPhone. It missed nothing of mine, if it missed your trip that is weird, maybe you had AirPlane mode turned on. PS: I think the app requires a 64 bit Mac to run because I tried it on my old core solo Mac and it didn’t work. So far i haven’t found this info on my win laptop yet. But I’m sure it’s somewhere there too. All phones do this, this is just the first time it’s been extracted and graphed. The only reason it’s news is its an Apple product. Actually, Pete Warden, who co-discovered this and compiled the viewer program said that they haven’t been able to find a similar file on android, and Microsoft has come forward and said that while they store location data it is deleted daily. This really is an inexcusable breach of privacy, and has a lot of potential to be exploited by third parties. It needs to be fixed by apple asap. I personally am completely shocked and disillusioned knowing ive been carrying around a tracking bug for almost a year. I don’t understand why you would defend this, its really disturbing. Isn’t this basically what 4square and Facebook are? They track you all over the place too, but it’s opt-in so nobody seems to mind… makes you think. It’s the fact that this wasn’t opt-in and that no one even knew it was happening. There may be good reason to collect this data but it shouldn’t be stored indefinitely, it shouldn’t be easily accessible and it should be possible to disable it entirely. Seems hopelessly inaccurate to me. Just tried it out and anyone who wanted to know where I had actually been would be none the wiser after using this data. The vast majority of what is reported is junk. Does anyone know if the steps outlined in this article still work for iOS 8.4?? I’m trying to get to the CellLocation table and can’t seem to find it. What I do have is a cache file that has the locationd consolidated.db….